NRMCA and Grey Matters hosted the 9th International Concrete Technology Forum in the Middle East at Ritz Carlton Hotel in Doha, Qatar on the 3rd of December 2017. The conference was a big success being sponsored by 11 companies where 155 personnel attended. For the second year in a row, “Al Khalij Cement Company” was the partner of the event. Qatar Construction Specification endorsed the event. The International Concrete Technology Forum was also endorsed by the “Concrete Sustainability Council”. The platinum sponsors were “Qatar Beton”, “Chryso” and “Doka”; the gold sponsors were “United Readymix”, “Hydronix” and “Simatec”; the silver sponsors were “Cortec”, “Kryton” and “Ciko Middle East”. Local, Regional and International speakers shared the latest developments and technologies related to sustainability initiatives, new technologies, design, specifying, manufacturing and handling of concrete. Moreover, the conference included a panel discussion where representatives of five different industries in particular within the construction industry in general constructively discussed different point of views and approaches related to acceptance and conformity of concrete. The panelists represented: ready-mixed concrete supplier, contractor, consultant, admixture supplier, and testing laboratory. Also, a graduation ceremony took place for the 4th batch of NRMCA Certified Concrete Professional Middle East (CCPfME) . The International Concrete Technology Forum are designed to provide networking and learning opportunities, where attendees received 6 professional development hours (PDH’s). 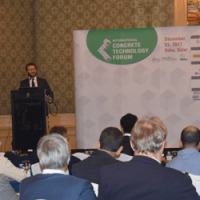 Researches, authorities, academics, engineers, architect, contractors, concrete producers, material suppliers and concrete industry professions attended the International Concrete Technology Forum and were part of this networking platform. The 2018 Conference date will be announced during mid of January 2018. Grey Matters is the professional entity serving the concrete industry in innovative manners. Our vision began in 2007 and materialized in February 2008. Grey Matters Head Office is based in Dubai - UAE, and caters the Gulf and the Middle East region with an office in Doha-Qatar.